Each of the X-books this month (with the previously-mentioned exception of Uncanny #321) end with reality being crystallized, then shattered, as a result of Legion's actions in the past (with the world of "Age of Apocalypse" taking the place of the existing reality). 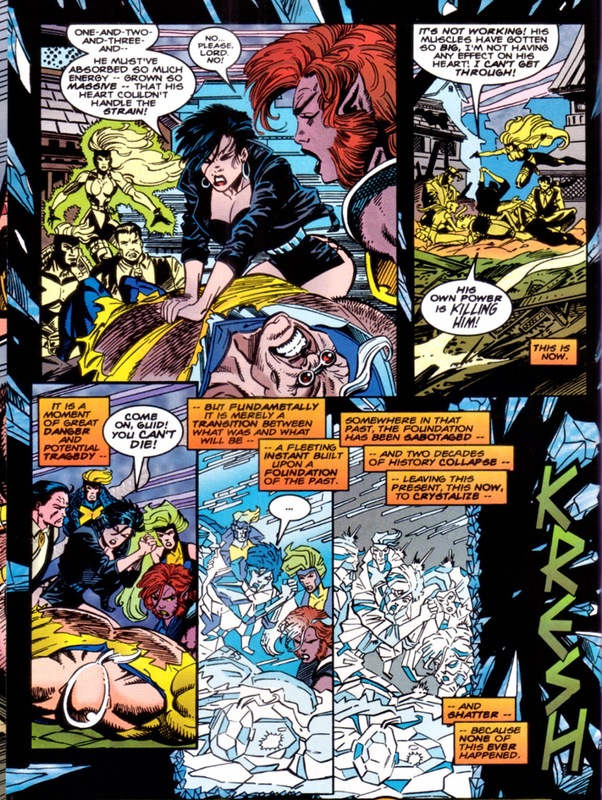 Most series also end their pre-"Age of Apocalypse" issues with some manner of cliffhanger (some moreso than others); here, Strong Guy suffers a heart attack shortly before reality shatters, the culmination of the running thread, begun in issue #107, regarding the effect his mutant power (specifically his ability to absorb kinetic energy) has on his heart. As with the varying degrees of cliffhanger, some series will resolve their pre-AoA cliffhangers more directly than others. 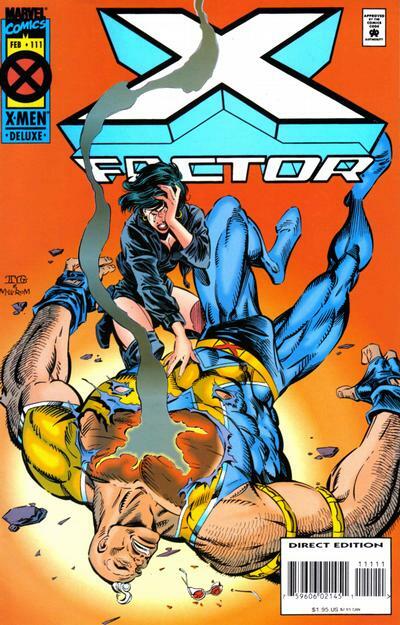 In the case of X-Factor, the fate of Strong Guy will be mostly handled off-panel, and this issue marks the end of his tenure with the team (he'll return for a trio of issues before the end of the series' original run, and then of course be a mainstay in the later revamped series alongside Madrox). 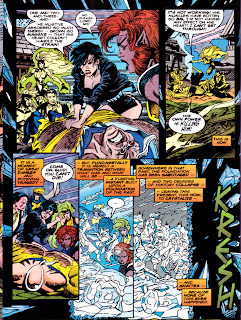 This is also Wolfsbane's last appearance in the series as part of the team; she'll leave off-panel to join her foster mother Moira MacTaggert on Muir Island, joining the cast of Excalibur post-AoA. Like Strong Guy, she will return for the 00s' iteration of X-Factor. Val spots Jamie Madrox walking the streets of DC, though the apparent return of Multiple Man is another plot thread that will get ignored for awhile coming out of “Age of Apocalypse”. This is Todd DeZago's final issue scripting John Francis Moore's plots; Moore handles both the plotting & scripting starting with Factor X #1. It is also Jan Duursema's last issue as the book's regular penciler, a run which began in earnest with issue #99. The big cliffhanger/reality warp at the end aside, this issue follows on directly from the previous issue, in which the US government's mutant team fights a bunch of aliens in Asia/on other planets, and as a result, it's just as far removed from the premise & purpose of the series as that one. Which is a shame because, more so than really any of the other series, X-Factor comes out of "Age of Apocalypse" the most changed. As a result, this issue marks really the last time this particular iteration of the team is on display, an iteration that, give or take a Madrox or a Forge, more or less goes back to the launch of the All New, All Different X-Factor in issue #71. Some of the characters in this issue will still be part of the series (though also, Strong Guy & Wolfsbane won't) and the group will still technically function as the US government's team of mutants, but the tone and types of stories and characters involved will be different enough that this issue can be considered the finale of the "All New, All Different" iteration as it's come to be known, which makes it a shame that, for the last hurrah, this isn't more consistent with what's come before. Tomorrow, Wolverine #90. Next week, X-Men (vol. 2) #41 and X-Force #43. My man Guido just can't catch a break. I hated that they did this to him. Then they made him a bad guy in Age of Apocalypse! 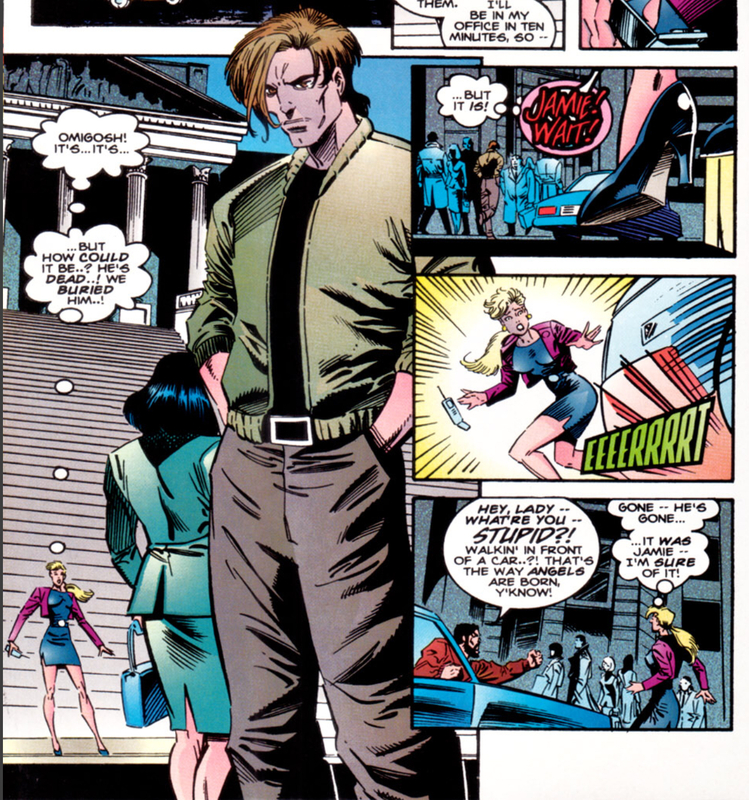 He got put through the wringer again in Peter David's 2nd X-Factor run. Still, nothing is as criminal as the mess they pulled recently in Uncanny. I'm less bothered by him having a heart attack than the fact that its used to write him out of the book, and that it all happens off-panel so he doesn't even get a proper send-off. Glad to hear someone else is disgusted with the current Uncanny run. There are so many people (many of whom have deliberately cultivated a "progressive & sensitive" public image) insisting it's brilliant, when it's just dour, exploitative, & cruel. I won't even get started on what/why I find the worst, since we'll be here all day. Needless to say, I'm bummed that Guido, a character near to my heart because of some personality overlap, is constantly used as a punching bag for cheap hacky drama. Poochy got a more heartfelt sendoff when he died on the way back to his home planet than Guido gets post-AoA. His character was put on a shelf and forgotten by his teammates until Peter David came back. At this point X-Factor is officially no longer the same book I started reading. Eventually Lorna will be the last character left from the "all-new, all-different" era as the book gets run into the ground. Mela, you are not alone. This run on Uncanny is not sitting well with me. I hope the relaunch this summer brings humor and hopefulness back to the X-books, but I doubt it. The last series I wholly enjoyed was X-Men Red. I am routinely several months/years behind the current stuff in my reading, but generally speaking, I've found the double-edged sword of modern comics is that, if there's a terrible creative team/direction going on, just wait! It'll be rebooted/relaunched in 12-18 months regardless. But at the same time, if there's a creative team/direction you actually like, well, be prepared to say goodbye, because inevitably, the book will be relaunched/rebooted/cancelled in 12-18 issues. I'm...not hating the current Uncanny run? I mean, I didn't like the 10 or 12 issue lead-up to Age of X-man, but for the most part, I don't think Uncanny is so bad once the lead-up was done. Though it is hard to get too attached to anything knowing there is yet *another* reboot happening in a few months time. Really, they are rebooting Uncanny again????? This was supposed to be the big reboot, it has a million writers. I listened to the head writer talk about it on Jay and Miles and tell us how cool it was going to be. The non-stop reboot of the series is really lame. I started buying it with issues 13, 14 hoping it would be okay, still haven't even opened them yet and sorry to hear Guido isn't doing so well in it. They did put him on the shelf after this issue and I didn't like what the series turned into when it came back. I didn't care for Shard, blah or the other castoffs the team became. Guido got a one shot comic after this as his sort of sendoff and Madrox also is basically gone until his series 10 plus years later. I think I stayed on reading for about another 5-10 issues but I know I've never read the end of the series or any of Mutant X.
I'm not sure if they're rebooting UNCANNY again already - I just know Hickman is coming aboard for a pair of limited series this summer, and that may or may not lead into yet another reboot (of course, given Marvel's proclivities these days, more likely "may" than not). As for X-FACTOR, as you'll see in the months ahead, the presence of Steve Epting on art is enough for me to coast along with this series, even as it more or less falls apart in terms of writing (though the presence of Shard bugs me too), but once Epting leaves, yeesh, it's a slog. And I'm not looking forward to MUTANT X at all.